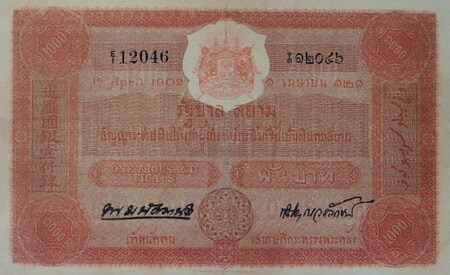 1000 Baht type 1 yellow offset at the middle, double outline alphabet watermark, serial number run from E1 00001. 1000 Baht type 2 change yellow offset area to brown microtext "THOUSAND TICALS", serial number run from E1 10001. 1000 Baht type 3 add serial numbers under signatures and change alphabet watermark from double outline to single line, serial number run from E1 20001. The 1000 Baht 1st series Thai banknotes were produced by Thomas de la Rue and printed only one side with flat ink as called uniface banknote. There were 3 types with little adjustment in details. 1000 Baht type 1 banknotes were announced on 7th September 1902. 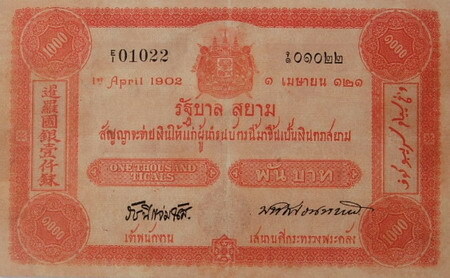 1000 Baht type 2 banknotes were announced on 23rd May 1909. 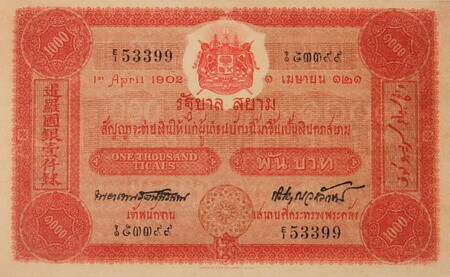 1000 Baht type 3 banknotes were announced on 1st November 1912. Type 1 starts from E1 00001. Type 2 starts from E1 10001. Type 3 starts from E1 20001..